When most of us think about Jewish wedding traditions, our thoughts turn to the preparations for and to the day of the wedding itself. But what happens afterwards? Whether you’ve already been celebrating holidays together, or are just now establishing your shared home life, Jewish tradition marks the first year of marriage in a special way — each week at the Shabbat dinner table. In many homes, challah, that delicious twisted Sabbath bread, is dipped in salt on the Sabbath eve as a reminder of the Temple service long ago. However, during the first year of marriage a couple can dip their Shabbat challah into honey. Being sweet, the honey celebrates the sweetness and joy of their love and of their new life together. This tradition of dipping challah in honey takes a page from Rosh Hashanah (the Jewish New Year) when everyone dips apples into honey to express their hopes for a good and sweet new year. I imagine you could adapt this tradition in a number of ways – perhaps, by finding other sweet spreads (Nutella, anyone?) or, after the first year of marriage, by placing a jar of honey next to your challah on the Shabbat closest to your wedding anniversary. Planning Your Jewish Wedding: What is a Ketubah? What is a ketubah? Why should we think about incorporating one into our wedding? How do we pick one out? 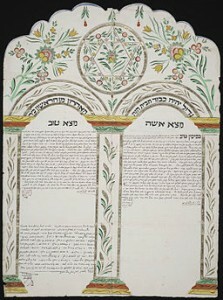 Originally a ketubah, or Jewish wedding contract, was a legal document that was given by a groom to his bride. It laid out the basic commitments the husband made to his wife, and its original purpose was to provide legal protection to women during marriage and in case of divorce or widowhood. As the roles of men and women changed, and marriage became a commitment between two equals, the role of the ketubah has evolved as well. Today in Reform (and other progressive) Jewish practices, the ketubah is a document that expresses the commitments the wedding couple makes to each other. These commitments might include: honoring and cherishing one another; listening to one another; or acting with love and respect towards one another. I encourage you to view choosing your ketubah as an opportunity to connect with each other about what matters most. Take some time some time to discuss what being married means you. What are the commitments you make for each other? What are you hoping as you establish your home together? How do you plan to care for and live with love towards one another? Use your answers to these questions to pick out a ketubah text that speaks to you and your relationship. You’ll likely notice that most of the time a ketubah will include artwork. 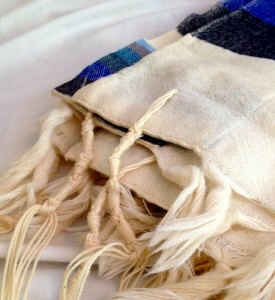 This is because the ketubah is not meant to be tucked away in a drawer. It is meant to be hung in the home, as a visible reminder of the loving commitments you make on your wedding day. If you are asking a rabbi to officiate at your wedding or commitment ceremony, it is a good idea to ask him or her to take a look at the ketubah you’re considering. She can help make sure that the text of the ketubah is a good fit for you. And, because some of the information that a couple needs to provide is in Hebrew, she can also help guide you in filling it out. Above all, choose a ketubah with artwork you love and with words that speak to you, frame it beautifully, and display it proudly in the home you establish together.